Same great line (with a few minor changes) but with a new name. SA launches the Freightliner Skagit, which is the same line from the past few years that we have been using. The blue line as we called it in the boat. The Intermediate Skagit gets a new name and a much requested cosmetic improvement , the rear loop will now have a black highlight to help you see the transition from the head to the running line. New video from SA feature SA Ambassador Jeff Hickman. 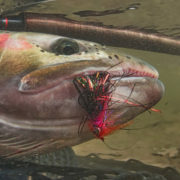 Scientific Anglers Freightliner Skagit from Scientific Anglers on Vimeo. We wanted to completely re-work our Spey offerings, and we started with our Skagit heads. Meet the Freightliner Skagit, an all-new design for Scientific Anglers. Featuring a textured, black marker at the rear of the head, and available in both floating and intermediate heads/kits, the Freightliner will become your next go-to Spey line. 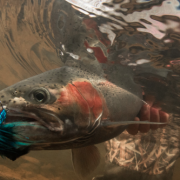 SA Ambassador Jeff Hickman dives into the details in this short video. 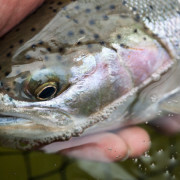 On Russia’s eastern coast, the remote Kamchatka Peninsula is teeming with wild Steelhead, kept protected by the country’s strict endangered species regulations. 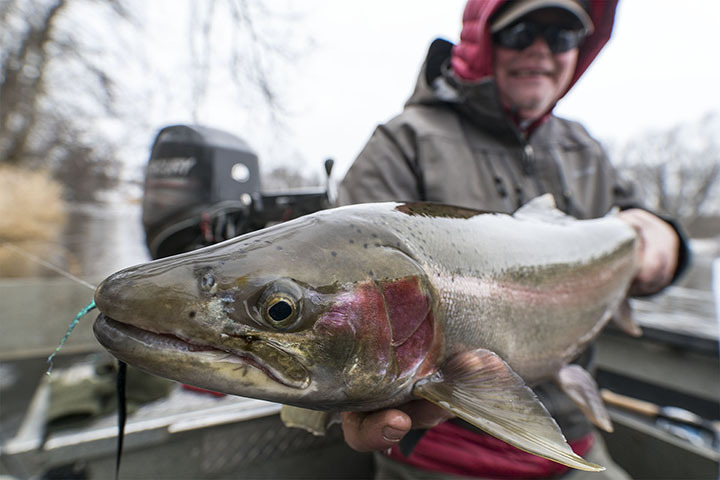 Follow Dr. Kuzishchin, Big Sasha, and their group of anglers as they document and preserve the legacy of Kamchatka’s Steelhead population. This image was a foggy morning on a lake rumored to have muskies in it. Although I caught a lot of pike and bass, the muskies proved to be elusive. This is one of my favorite lakes in Michigan. 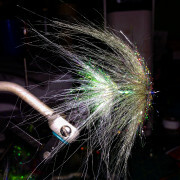 I fished it in September for a couple of days. It never fails to rain when I fish here, and soon after this very scenic moment, I was drenched. 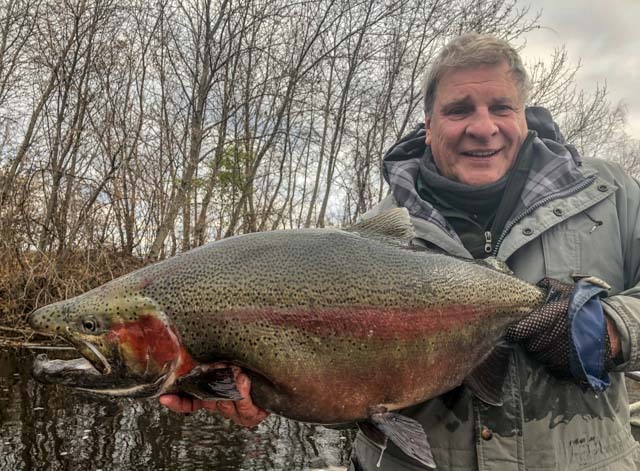 Steelhead are so beautiful, and so majestic. This one put up a tremendous fight in early November! I hope you enjoyed the photos! 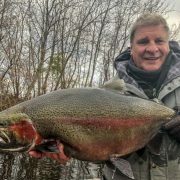 Good fishing to you in 2017! https://mangledfly.com/wp-content/uploads/2017/01/new-year-kevin-feenstra.jpg 378 640 Kevin Feenstra http://mangledfly.com/wp-content/uploads/2014/07/logo.png Kevin Feenstra2017-01-04 18:51:042017-01-04 22:14:41Happy New Year! 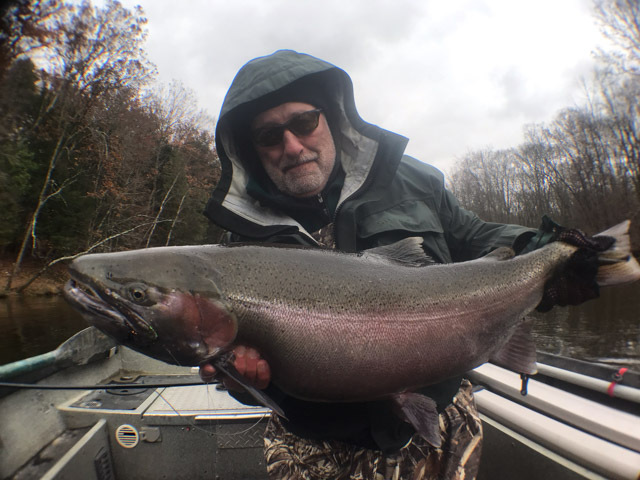 Nothing cooler than a fall steelhead! These are a few of my favorite recent photos. 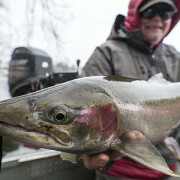 Without a doubt, January is one of the hardest times to fish for steelhead, especially if you are waiting for a pull. It really is rewarding when you have a chance to land one. This year it is even more so, as it was a challenging fall. The fish above took a fly after the better part of a day without a bite. I was very excited to fish on this day as I had a pair of battery powered heated gloves. The gloves were a $120 failure but near the end of the day, the fish made the time on the water a success! 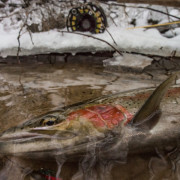 A steelhead is a flash of lightning and a splash of color in an otherwise dreary day. This fish viewed its home and went there….See you next year, I hope!!! !